Qingdao is a beautiful seaside city on the southern coast of the Shandong Peninsula. The city is known as a one of China´s important economical cities, has a first-class port that ranks number two in China and is a major cargo and passenger port. 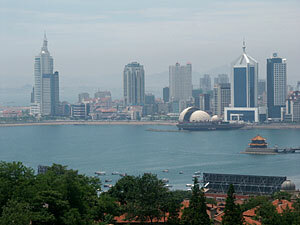 Qingdao is also a first class unique tourist spot with its face to the Yellow Sea and the Jiaozhou Bay. The city is built on rolling hills with a mix of appealing European and Chinese architecture. It´s a green city with parks and the green hills and you find yellow sandy beaches centrally located. Add an attractive climate and you will understand why this “City of Sailing”, sometimes also called "Sailing City is a well known summer and health resort. The most famous product of this eastern Chinese city is Tsingtao beer from Qingdao Beer Company but you can also find international known enterprises like Haier Group (refrigerators and air-conditioners), Hisense Group (consumer electronics and home appliances) and other coompanies in the forwarding, oil and food processing sectors. So welcome to Qingdao to discover a city that always has something to offer for both business and tourist travellers.